There is no doubt that immunity to human cytomegalovirus (CMV) is both cell-and antibody-mediated. Studies in transplant patients showed that absence of T-cell protection with chemotherapy is a set-up for recurrent and severe CMV disease. It was also shown that patients with pre-existing CMV antibodies are less likely to develop CMV disease than CMV-negative transplant recipients receiving a CMV-positive graft or organ. Interestingly, there are, let us not forget, patients with agammaglobulinemia who are prone to infections caused by encapsulated bacteria but not CMV. In summary, cell-mediated immunity would seem to be considerably more important than the humoral immune system for defense. Maybe it should not be surprising that results of studies with polyclonal hyperimmune serum were so conflicting and confusing. Prophylactic hyper-IgG preparations seemingly improved the severity of CMV disease but clearly were not able to prevent infection as such. They are being used sparingly in select patient populations only. Many years ago, PDL Biopharma (formerly Protein Design Laboratories) started a program with MSL-109 and was able to show good efficacy in AIDS patients with CMV retinitis. However, their timing was bad: since the advent of HAART, CMV retinitis has all but disappeared. There was also another trial in which mortality was actually worse in the MSL-109 arm. The project was consequently abandoned. There were several other attempts at neutralizing CMV with mAbs that we will skip over here; we have to refer the interested reader to some recent reviews on the subject. Now we would like to introduce you to RG-7667 which is a mix of 2 monoclonal antibodies produced by Genentech: the first mAb is an improved version of MSL-109 directed against CMV surface glycoprotein gH, the second a mAb directed against a penta-complex consisting of gH/gL/UL128/UL130/UL131, reminiscent of a target also studied by Novartis when they were still in the vaccine business. Full results of the first clinical Phase 2 study of the RG-7667 program just appeared in print. In a well-designed study, approx. 120 CMV- renal transplant patients who received a kidney from a CMV+ donor, were treated with RG-7667 or placebo in a double-blinded fashion. This is a high-risk patient group for more severe primary CMV infection and an appropriate study population for a Proof-of-Concept trial. We applaud the Genentech team for resisting the temptation to also include CMV+ patients; this would be another target group for a separate investigation, as would HSCT recipients. Studies in transplant patients are complicated enough already given the different anti-rejection protocols across centers in many countries, the non-standard approach to starting anti-CMV drugs like HD acyclovir or ganciclovir and differences in opinion among experts on what to call “significant viremia”. Progress, however, is being made in the quantification arena. While we had to deal with semi-quantitative pp65 assays a few years ago, the researchers were now able to use a VL assay and uniform cut-off. 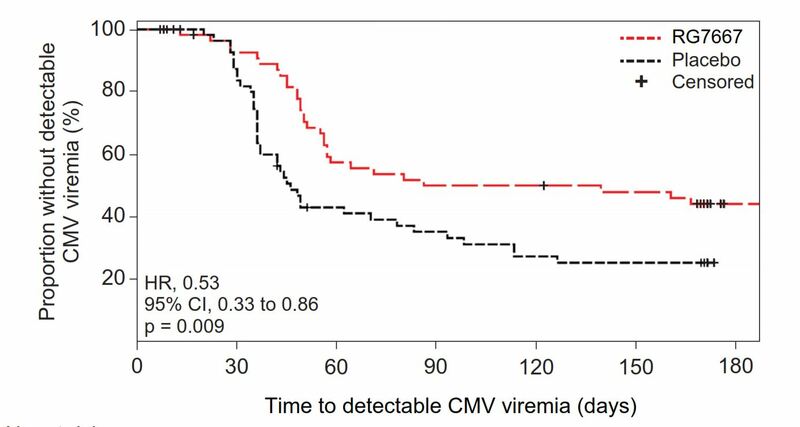 While the study missed its primary efficacy goal, i.e., prevention of CMV viremia, there was a consistent trend of benefit along several important outcome measures, most importantly the incidence of CMV disease which was reduced significantly in the 24-week post-transplant period (from 15.8% to 3.4%; p=0.03). Other parameters improved in a major albeit non-significant manner: onset of viremia was delayed and development of viremia reduced in frequency. We are impressed with the results and venture to say that the results may be just as good as it gets for any IgG-based intervention. Clearly, one would like to see more data confirming these results in the same population and others, for instance in CMV+ renal transplant patients and in HSCT recipients with different CMV serologies. The RG-7667 monoclonals were safe at the doses tested and could provide a meaningful level of protection. An important group – pregnant CMV- women exposed to CMV – is extremely difficult to study but feasible once more information is available. Both a prophylactic and/or pre-emptive treatment with a RG-7667 could be envisioned for this population. Disappointingly, Clinicaltrials.gov does not list any ongoing clinical study activity for RG-7667, and neither the Genentech nor the Roche pipeline mention the combination in their roster of development candidates. Maybe the data were not convincing enough for the corporate decision makers, maybe the project was abandoned given competing priorities in a portfolio heavily weighted towards oncology. Perhaps the recently announced good results with the direct CMV antiviral AIC-624 (MK-8228) made RG-7667 less attractive for investment. We don’t have answers to these questions, but it seems that development of RG-7667 and its cocktail of monoclonals is no longer being actively pursued. Surprisingly, neither Ishida article mentions that RG-7667 has been discontinued; instead, the authors suggest that further studies are warranted given the Phase 2 results. Admittedly, there may be another reason: the science has moved on for mAbs in CMV. Papers published by the Novartis and Genentech research groups in the last 5 years identified novel viral entry and escape mechanisms employed by CMV, not merely avoiding but actually using and repurposing the mAb in a very ingenious way,. This proves that CMV is not only the virus with the largest genomic complexity but also one with a fantastic repertory of ways to play hide and seek with the immune system. Please leave a comment and share your insights regarding the role of mAbs for CMV. This entry was posted in Recent Literature, The News, The Viewpoint and tagged acyclovir, AIC-624, Aicuris, AIDS, antibiotic blog, CMV antigen gB, CMV antigen gH, CMV antiviral therapy, CMV disease, CMV in renal transplant, CMV prophylaxis, CMV retinitis, CMV serostatus, CMV viral load, CMV viremia, cytomegalovirus, efficacy of mAbs against CMV, ganciclovir, Genentech, HAART and CMV retinitis, Harald Reinhart, hyperimmune globulin, IgG, Merck, MK-8228, monoclonal antibodies, MSL-109, Novartis, PDL Biopharma, pp65, Protein Design Laboratories, RG-7667, Roche by Harald. Bookmark the permalink.